meet or exceed ANSI A14.3, OSHA 1910.27 and 1926.1053 standards. greater than 7' in length. rungs space on 12" centers. and available from 10' to 29'. 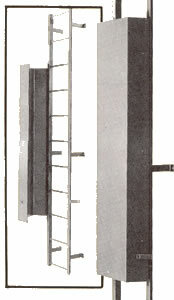 extend 42" above landing surface. 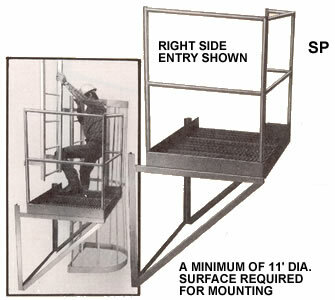 round climbing rungs on 12"
SHIPPING NOTE: All 15 thru 28 rung Series F models with cages ship in 2 sections. All 29 and 30 rung models ship in 3 sections. 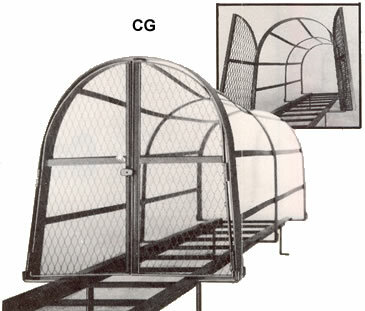 SHIPPING NOTE: All 15 thru 25 rung Series F models with cages ship in 2 sections. All 26 thru 30 rung models ship in 3 sections. constructed with left or right entries as required. lockable hasp for complete security. Shipping wt. 83 lbs.